Vol. 5 in the Moonwood rehearsal tapes series. Just over an hour of material edited down from 4 sessions of solo improv guitar jams. Meditative ragas, analogue space drones and black ritualistic fuzz. Babel – Limbus – dlx Stencilled Jewel Case ed. Limited edition of 25. 13 track CD in hand-stencilled cloth bags (see tin box edition) and spray-stencilled jewel cases. Comes with full colour “posterette” insert . 59 mins. $9 CAD worldwide (includes shipping). Two new releases in the Moonwood live rehearsal tapes series. Both feature Stephen Wolf (Summer Amp, New Yaki, Partli Cloudi, etc) on percussion, prepared bass guitar and, we think, moaning vocals. Vol. 3 is over an hour of live jams recorded straight to 2-track as a duo over 2 days somewhere between the pyramids and the cosmos. Vol. 4 (aka “Moonwolf”) is a half-hour set recorded live as a trio on October 6th. “Mowgli” is a straight live take whereas “Akela” is three live jams spliced together, adding analogue synth and a barrage of percussion instruments into the usual Moonwood stew. 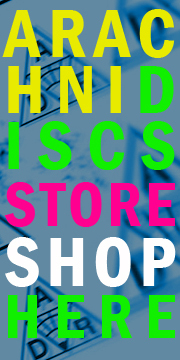 You are currently browsing the ARACHNIDISCS RECORDINGS blog archives for October, 2011.